The famous monasteries in Sikkim are the Tsuk-La-Khang Monastery, Enchey Monastery, Rumtek Monastery, Phodong Monastery, Pemayangtse Monastery and Tashiding Monastery. Tsuk-La-Khang Monastery is located in the Palace premises near the Ridge in Gangtok. Tsuk-La-Khang monastery is a two storied monastery and was used during royal functions like weddings and coronations. The Phang Labsol and the Loosang festivals are celebrated in the ground adjacent to the monastery once in a year when the Chaams or the masked dances are performed. 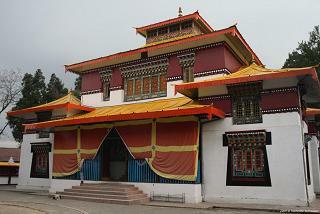 Enchey monastery is one of the most important monasteries of Sikkim. The Enchey monastery is constructed on a site blessed by Lama Druptob Karpo. This monastery is located close to the Sinolchu Tourist Lodge and the TV Tower. 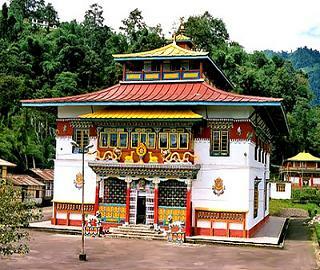 This monastery is located in a dense wood and one can view the Kanchendzonga range over the crown of trees. The monastery follows the Nyingma Order and the main Puja and dances are held here on the 18th day of the Tibetan calendar. The Rumtek monastery is located on a hill, about 24 kms from Gangtok. This monastery is said to be a replica of the Tsurphu monastery of the Kagyupa order in Tibet. The first monastery was built at Rumtek in 1717 but crumbled to ruins due to aging. The second monastery was constructed by his Holiness, the Gyalwa Karmapa in 1960. 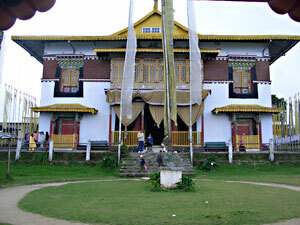 The monastery belongs to the Karmapa Sect of Buddhism and is the largest monastery in Sikkim. This monastery has beautiful traditional architecture, carved and painted woodwork, magnificent murals, manuscripts and icons. Pemayangtse Monastery is situated about 6 kms from the Gyalsing town. It is one of the most important monastery of the Nyingmapa order and was first built as a small temple in the late seventeenth century by Latsun Chempo. Later during the reign of the third Chogyal Chakdor Namgyal, Jigme Pawo extended and rebuilt the structure in the form of a big monastery. The monastery houses numerous religious idols and other objects of worship, most of which are priceless. On the top floor of the monastery there is a wooden sculpture portraying the Mahaguru’s Heavenly Palace Sangthokpalri. The main festival of the monastery is celebrated on the 28th and 29th day of the 12th month of the Tibetan calendar, in the month of February. Tashiding Monastery is a Buddhist monastery of the Nyingma sect of Tibetan Buddhism in Western Sikkim, northeastern India. 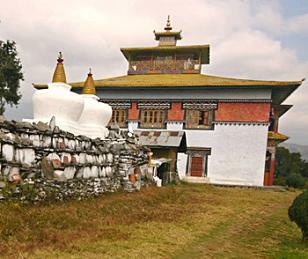 Tashiding monastery is located on the top of a conical hill, near Pemayangtse. This monastery is the Sikkim’s most venerated shrine. The Tashiding Monastery was built in 1717. The countless of prayer flags whisper in the air as one approach this holiest site. The word Om Mani Padme Hum written on these prayer flags fills the air. In the spring season thousands of Buddhists visit the Tashiding monastery to participate in the Bhumchu festival and sip the sacred water from a sacred Bhumpa (water vessel), filled with waters collected from the Rahthong and Rangit rivers. Phodong monastery is located within an area of one square kilometer and about 40 kilometers from Gangtok on the North Sikkim Highway. Phodong Monastery belongs to the Karugpa Sect (Karmapa) and was built by the Chogyal Gyurmed Nammgyal in the first quarter of the eighteenth century. The main annual puja is performed on the 28th and 29 day of the tenth month of the Tibetan calendar in which the religious Chaams or dances are performed. Labrang monastery is also located on the same road just about a kilometer from the Phodong monastery on the North Sikkim Highway. This monastery was built about one hundred years later but belongs to the Nyingmapa sect.